The giving of wedding favours is a popular tradition worldwide and goes back many years. It is thought the first wedding favour was given out by the European Aristocracy and upper classes, and usually contained sugar or confectionery, which was a symbol of wealth (as sugar was expensive at this time and only the wealthy could afford it). Over the years (around the 13th century) these were replaced with sugared almonds, to signify good wishes for the couple’s new life together. Five sugared almonds are traditionally given to signify health, wealth, happiness, fertility and long life. These are still popular today and are usually displayed in organza bags or favour boxes to match the decoration of the wedding/couples colour theme. It also adds to the table decoration, and favours can also double up as place settings, if required. Other popular favours are miniature alcohol, shells, pebbles, cookies, sparklers and bubbly. 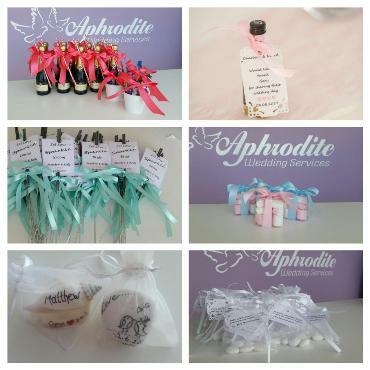 Please see the attached photo for a small selection of favours, that we, at Aphrodite Wedding Services, can provide for your special day.